Late last year, I set out to build a complete AR on a shoestring budget. All I had were some leftover internal parts and an extra Anderson stripped lower sitting around to start with. The rest of the parts were purchased on sale or clearance during last year's Thanksgiving and Christmas holidays. All together, I have a little under $500 in the rifle itself. With optics and mount included, the total is around $650. I didn't have much in the way of expectations for the rifle, since it was a rather extreme budget build. However, on the first outing with it, I shot some test loads with the Hornady 62 grain BTHP's and managed to produce sub-MOA groups with Benchmark, Varget, and Tac powders. I'm absolutely impressed with it so far. I've always been in the "you get what you pay for" camp - I just get an absolute thrill on those occasions when you get much more! Looks good. Nice when it all comes together. I am doing the same thing, a budget build in the works. Wanting a deer caliber tho. Deciding on 6.5G, 6.8spc, or 450bm. They all fit the bill for my hunting. I have to admit; I am a huge Grendel fan. If I had to choose out of those three, it would be Grendel - hands down. In terms of ballistics, its right on par with 6.8, but you get a much, much better choice of bullets with 6.5. Grendel is also very versatile. It's fantastic for deer, hog, and coyotes. I kinda see the 450 as more of a short-range thumper. That said, if you're leaning towards 450, don't forget to check out the 458 SOCOM. 450 does have a little more oomph than the 458, but I think there are some better bullet choices for the 458. Also, the 458 is a shouldered cartridge, so case trim length is not nearly as critical as it is for the 450. They all have pro's and con's. Good luck with your next build! I mean, it can probably kill more than tacks, if I wanted it to. It did a heck of a number on the paper I was shooting over the weekend. If things get that far out of hand, I do have an AR-10 in .308 that I can use. ive put together a half a dozen cheap ars and they all shoot great. Don't know about you but to me it feels even better when I walk up to a sub moa target that was put together by me. Im about allways building a new one. Just finished a 300 bo 16 inch gun and already have a complete lower build. Probably will be given to my son in law when its done. When that ones done I already know what the next two will be. A 300 bo pistol and a 6.5 rifle. After that ill have to do some thinking. But even if I build some basic psa entry level ars and stick a couple under the bed. Some day ill make some money off of them or they will make good trading material. at least I wont loose as much as I will trying to trade an entry level bolt gun in. Last edited by lloyd smale; 03-27-2019 at 07:35 AM. My last build (#6 .223 Wylde 1:8) cost $355 minus optics. I tested it with Remington Corelokt ammo because I had the ammo laying around. 6 shots to zero the scope and 34 more shots just because it was shooting so well. Not a single hiccup and accuracy comparable to any bolt gun I own. 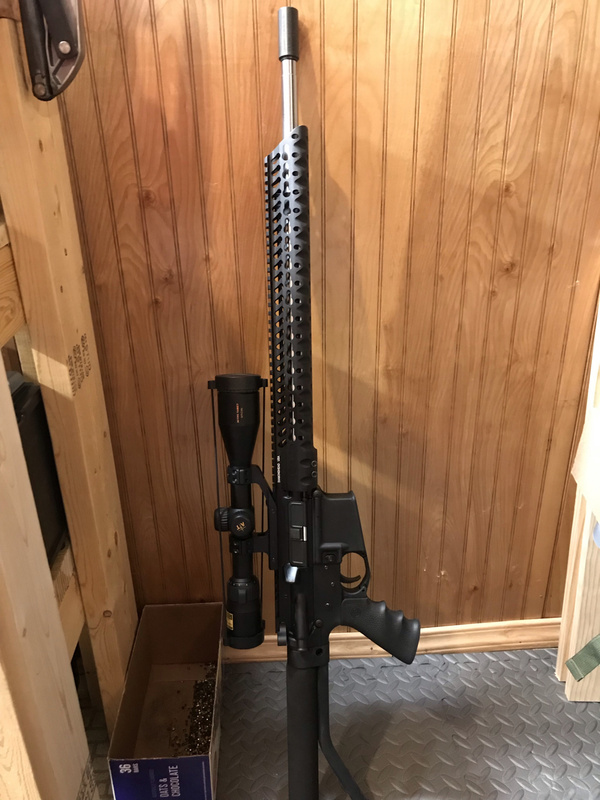 There may be something about high dollar AR's that I don't understand, but for hunting and casual target shooting, I've been more than pleased with budget parts. I do have mixed feelings on the matter. I've built some budget rifles that shot really well and some that were a little disappointing. On the more spendy rifles, you're paying for more QC and a better fit & finish. Most people forget that, when you build your own, you are the QC department. If things don't work quite right, you're the one who gets to figure out what's going on. Also, on those higher end, factory built rifles, parts that are machined in-house are machined to fit each other and parts that are outsourced are usually ordered to fit a certain specification, so you don't have that tolerance stacking issue that can pop up in a home build. There are pro's and con's to doing it either way, so I don't see one as inherently better than the other. I like you guys! I have watched so many people throw away so much money on AR15s because of what they read in the gun rags. Last fall before winter set in I was at Brownell's Big Springs shooting range with several other guys. I was sighting in a bolt gun so I didn't have a dog in the fight but got the privilege of watching several guys shooting AR 15s. It really does my heart good when I see a $1500 LWRCI get shown up by a $500 kit gun. The guy shooting the $500 gun had a Barlow knife and Multi tool on his side which told me that he was a hands on kind of guy. Probably tailor loaded his ammo for accuracy and knew the particulars of what he was up against. Where the LWRCI fella had a thick wallet and since he isn't interested in hands on stuff he got left in the dust by someone that was......and it makes me smile!